Wife Rachel is expecting their first child, a son, around July 21 and Donaire’s focus is on their first born and not on boxing, at least for the moment. At the same time he indicated that the manager of his younger brother and WBO champion Mikey Garcia – Cameron Dunkin - had told him that Mikey may face “Juanma” Lopez “possibly in June” or No. 1 contender Orlando Cruz. “Juanma” Lopez also won over the weekend scoring a 2nd round knockout over Eugenio Lopez in Mexico City. 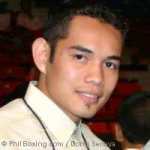 Garcia believes Donaire “is in a good position to fight Terrazas” the newly-crowned WBC super bantamweight champion who won the title relinquished by Abner Mares who moved up to featherweight and will face WBC champion Daniel Ponce De Leon for the title on May 4 in Las Vegas. Victor “Vikingo” Terrazas won a close split decision over former WBC super flyweight champion Cristian Mijares in Mexico City on Saturday. Judge Fernando Barboza scored it for Terrazas 114-113 along with Nathan Palmer 115-112 while Cathy Leonard had it for Mijares 114-113.